I spotted something odd on the shore as I was going by to Gunner inlet! I stopped and got the binocs out and saw that it was a dead Sea Lion,but it looked odd? Turns out the reason why it looked odd is that someone took the hide off of it as well as the head and flippers! This is a bonus at this time of year! I am coming back tomorrow with all my trail camera gear and set it up! The wolves are going to be chowing down real soon I suspect! I promise not to screw up this time either! 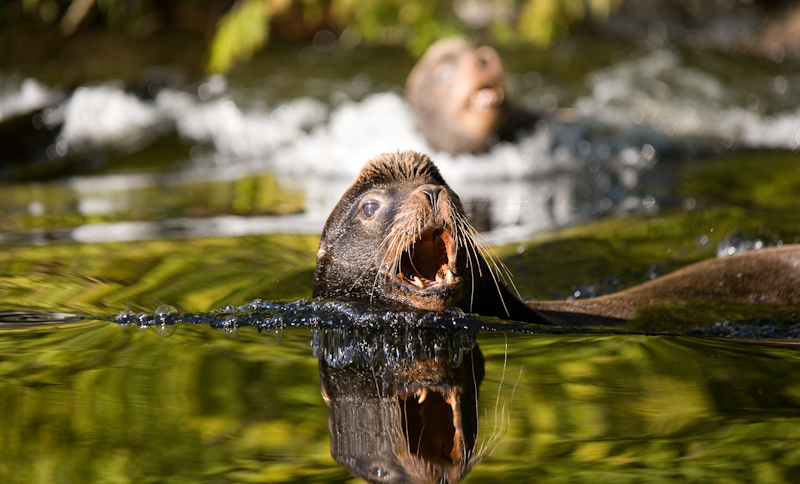 The Sea Lions are having a party in the woods down at Cannery bay and I think all the bears are jealous! It appears that the floor on that small building the Natives built down in Cannery has collapsed! No doubt from all the weight! It would of been many tons! I’m going to check my previous shots,but I could swear that this structure had plywood sheeting up on the sides? We had a big wind storm a few days ago and it could of torn off all the plywood? I hope the natives are not too upset at the Sea Lions? They are only doing what comes natural to them! In another shot you can see a Sea Lion trying to warm up it’s feet and hands(as it were). They thermal regulate their extremities this way. The air is warmer than the water,so ergo they stick their flippers out of the water to warm up! I saw her coming into the harbour from the west and I also saw a Sea Lion going through the harbour in the other direction! The harbour is always busy with boats and many different animals passing through it! The boat went to 4rth St.dock to tie up for the night. Not sure what they fish for? They did Geoduck last month. New Water World Theme Park! The line up for that new slide ride looks brutal! I was able to get out today! Finally!!!!!! I needed that so badly! All my furry friends were in fine form. This float is down in Cannery Bay (well,very close at least)and is used by the local Natives during the summer time. When it gets hot,many of them go down to this spot to cool off ,and it would appear that others go here in the winter to warm up! Seasonal irony I suppose? The entire float was flush with the water level. Each one of these males can weigh in at half a ton! There may be 20 tons on this float right now! No wonder the float is almost submerged! The light was good in the morning ,but by the time I got out(2pm) a high overcast covered us. I was alittle ticked,but soon realized that it was just passing through. I saw blue sky to the west and just waited for the cloud cover to pass over before I started shooting. Gave me time to have lunch with my friends and observe them. It was a good day out! Lots of fun and adventure today! Like a breath of fresh air……………..I needed that! This group (or Crash) of Sea Lions was swimming around,ignoring me. They just didn’t like me being near them when they were on the rocks!